Unionist political parties ably assisted by the BBC and Unionist press are fermenting despair in Scotland through a campaign of disinformation seeking to manipulate the minds of Scots to accept that the days of Scottish self sufficiency in oil, gas, and renewable ‘s are numbered in a few years. Scots will by result remain to be a heavy financial burden on Westminster. They are simply incapable of governing their country since they are not bred to do so. Westminster Unionist politicians, skilled in the dark arts are lying, much as they have for 300 years so that they will be able to control Scotland dictating all aspects of life within its borders. Acceptance of the “porkie pies” by Westminster should mean that England has no further need of Scottish waters stolen by subterfuge by Tony Blair and the Labour Government in 1999. Nicola Sturgeon should at the earliest opportunity require the illegal removal of Scottish Waters by Westminster to be reversed as part of the 2016 Scotland Act. A 2014 UK government commissioned report, compiled by an Aberdonian member of the unelected House of Lords stated there were around 24 billion barrels of oil yet to be recovered from the North Sea. The figure quoted considered recoverable oil in the North Sea block only. It did not include the North Atlantic, West Coast of Scotland or Rockall areas since these are largely unexplored. Enter the spoiler, “The Clair Field”. First discovered and located in the, “Atlantic Sector” of the, “Continental Shelf” in 1977 it was declared, “off limits for discussion” by the UK government. Unionist media manipulators then broadcast widely and often, (making full use of the Unionist media and press) that the oil would run down in the 1990’s. Job done. Scotland, “back to sleep” it was thought by the Westminster con-men. Many years later, in 2003 a license to explore the Clair field was finally granted to BP. Surprise, surprise, “sweet oil, in excellent quantities flowed freely, and this was only phase 1. Phase 1. Has produced 90 million barrels of oil since operations began in 2005. Phase 2. is expected to produce reach peak production capacity of 120,000 barrels of oil per day, after operations begin in 2016. And we are addressing only one field. But here we are again. “Blether Together” politico’s, (largely comprised of discredited time spent old men of Westminster) are now spreading the lie that oil will run-out in 15-20 year’s. The initial commitment involves a two year programme to drill five appraisal wells. This could increase to between eight and twelve wells, depending on results from these first wells. Drilling of the first well commenced recently. The objectives of the programme are to provide greater certainty on overall reservoir volumes, including their distribution and fluid characteristics; to evaluate technologies to improve recovery from Greater Clair; and to test the possibility of new stand-alone developments and linkages to Clair Ridge. Edward Davey, Energy and Climate Change Secretary, said: “This announcement by BP of a two year appraisal programme for the Greater Clair area West of Shetland is excellent news. It shows the industry’s commitment to maximise the potential in this area, which could hold up to 17% of our oil and gas reserves. John Hayes, Energy Minister, said: “Greater Clair is extremely significant as it reinforces West of Shetland as an important area of future oil and gas development. The Jasmine field is located near Conoco-Phillips’ Jade and Judy fields. Once on plateau, Jasmine is expected to contribute around 30 000 barrels of oil equivalent per day. Group Chief Executive Officer Chris Finlayson said “The start-up of production from Jasmine marks the delivery of yet another key 2013 milestone. 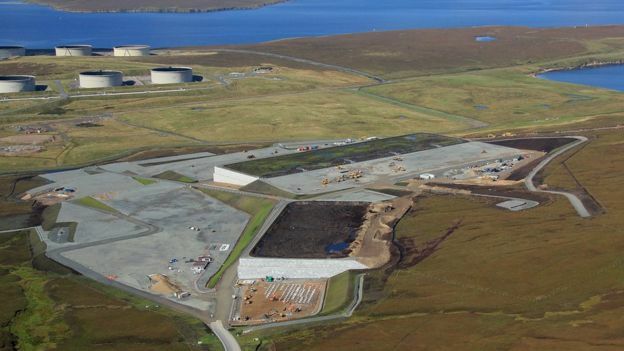 Production has begun at a new gas plant that will bring the vast reserves west of Shetland to the mainland. The Shetland Gas Plant is expected to provide about 8% of the UK’s (100% of Scotland’s) gas needs. A flare was lit at the moment gas started flowing to the plant, which will serve the Laggan and Tormore fields. The two gas fields lie about 125km (77 miles) to the north west of the Shetland Islands. The plant is said to have been the biggest construction project in the UK since the London Olympics. Total said the Laggan and Tormore fields will produce 90,000 barrels of oil equivalent per day. The gas will be piped to the plant, which lies just to the east of the existing Sullom Voe Terminal, before a pipeline takes it to the UK mainland and into the national gas grid. Almost 20% of the UK’s remaining oil and gas reserves are thought to lie in the area to the west of Shetland. The project is part of a massive £3.5bn investment by French company Total. Challenging weather conditions delayed the project by more than a year and added millions to its cost. Shetland MSP Tavish Scott said Total’s announcement showed that the prospects for west of Shetland looked positive despite the “doom and gloom from some about the future of oil and gas”.